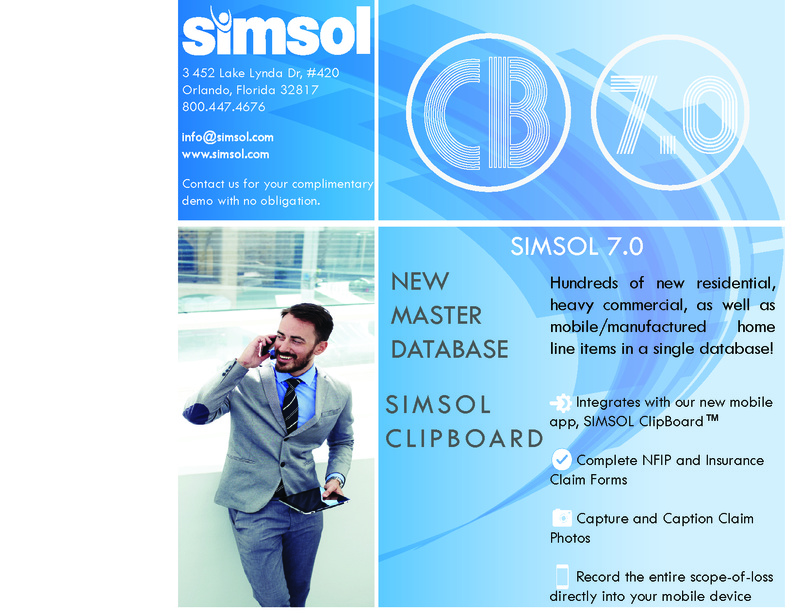 Latest enhancements of SIMSOL 7.0 provide a more robust database and integration with Simsol’s new ClipBoard™ mobile claim documentation app. The new database contains over 3,000 additional materials and almost 20,000 new construction scope operations compared to our 2015 cost database. The newly combined database is now on par with our leading competitor. SIMSOL Software (Simultaneous Solutions, Inc.) announced the release of the newest version of its popular loss estimation and documentation software for adjusters and restoration contractors, SIMSOL 7.0. Version 7 contains a completely redesigned restoration cost database containing thousands of newly added construction materials and operations for the repair of damaged homes and commercial structures. Another significant enhancement found in version 7 compliments another new release by the company, SIMSOL ClipBoard™ (CB). ClipBoard™ is SIMSOL’s first totally mobile app designed for Apple® and Android® devices. SIMSOL 7.0 also contains a wide-range of other improvements including a new library of insurance forms to complement the NFIP’s new Mentee Program as well as other specific forms for complex calculations necessary for handling NFIP flood claims. Please find additional information about the advancements of SIMSOL 7.0 on their website. SIMSOL Software (Simultaneous Solutions, Inc.) is based in Orlando, Florida. SIMSOL has over 25 years of experience in the insurance claims industry and continues to innovate and enhance the claims management process with their newest release of SIMSOL 7.0 for insurance adjusters and restoration contractors. Please visit SIMSOL on their website or call 800.447.4676.